I think I may have mentioned this before, but just to underline the absolute truth of it, I love bringing home food stuff from my travels. It is, in book at least, the best souvenir**. Each little morsel that I take with me represents a mouthful of where I have been, encapsulating a perfect, “bite-sized”, snapshot of a place that I can re-experience back home. Spain is a haven for food shopping, what with their wizardry in curing and preserving meats. Anyone who has tasted a gossamer-thin, glistening slice of jamon iberico de bellota can attest to that. In Barcelona in particular you also have the famous La Borqueria, the city’s famous market that can trace its history back to almost 800 years. In and around you have places that have been there for centuries, offering up specialties perfected a hundred times over, sitting shoulder to shoulder with establishments captained by brazen new chefs pushing their envelopes in the most delicious ways. I know food is not the most permanent of souvenirs (I have another favorite as well not to worry**) but really, when you are back home with the phone ringing and the emails pouring in and the weather going to pot, and you are dreaming of one more day in Barcelona, wouldn’t you rather be biting into this than scrambling to find space for yet another mug? – Toast or grill the bread. Rub the toasted bread with the garlic, cut side down. Rub the bread with tomato halves, crushing slightly so the bread is smeared with the tomato juices and pulp. – Meanwhile, heat a couple of swirls of olive oil in a non-stick skillet. When hot, add the eggs and, as the bottom sets, push the set parts around gently with a wooden spatula. Continue pushing gently until you have softly set curds of egg (you can cook it more if you like your scramble firmer). Remove the egg from the pan immediately so it does not continue to cook. – Drizzle the garlic/tomato-rubbed toasts with the best olive oil you’ve got. Sprinkle with sea salt flakes. Congratulations, you’ve made pan con tomate! – Divide your chorizo between the pan con tomate. 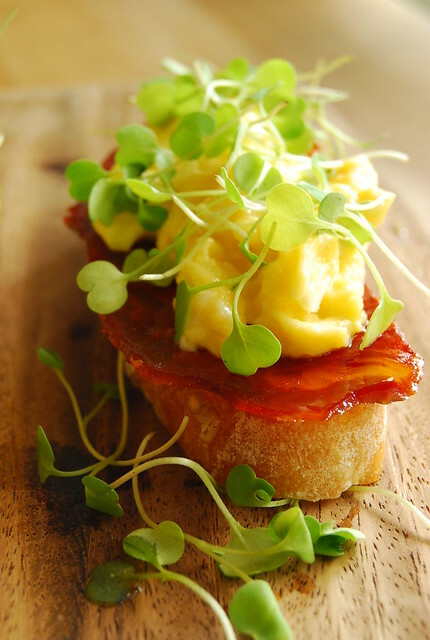 Top with egg and micro arugula. This is really a tapas type dish, but if we can eat dessert for breakfast I don’t see why we can’t have a bit of Spanish bar chow for breakfast either. It’s got cured and seasoned pork (and not just from any pig but from some of the best in the world! ), egg, bread, and even greens. A breakfast for champions certainly. And if you decide to make many mini versions for an appetizer spread, well that’s allowed too and I can guarantee it will go over famously with your guests. This was my first encounter with micro arugula and it will surely not be my last. I chanced upon them in my weekend market from a newish purveyor who sells a variety of micro greens (along with grass-fed beef and pork!) and had to try them, seeing how much I love their “macro” versions and sprouts in general. They have a milder version of regular arugula’s peppery kick. They are wonderful in this montadito, and are just as perfect in a homemade chicken salad sandwich. I used chorizo iberico de bellota here but feel free to experiment with other Spanish cured meats such as salchichon iberico or fuet. If you are feeling particularly luxurious you can try this with jamon iberico de bellota instead. You can also replace the micro arugula with other micro greens or sprouts. I procured this chorizo from my godmother’s friendly neighborhood xarcuteria (charcuterie). It’s a fantastic, treasure trove, kind of place with jamon ibericos hanging from the ceiling, a platter of handpicked cheeses set out on a table for the customers to try, and one of the owners behind the counter to help you along in your selection. What a beautiful and scrumptious toast!!! wish I had those chorizo 🙂 what's a good substitute? That toast looks magnificent and so scrummy! A breakfast fit for a king. What a pretty, pretty photograph! As pretty as the poetry of your chosen words. Loved it! The micro-arugula makes it look so perfect. What's great it this can be made with other hams or sausages too. Proscuitto, Parma, etc. Umm… Damn, now I'm hungry. I cannot wait to try this special little bite of deliciousness! I love Spanish chorizo. The photo you took makes me want to leave my house right now and go to my local Zupans market place and buy some. Actually I think I will do just that. I thought it was funny though… The other day I ran to Target to buy house stuff, and I was passing through their grocery aisles to get to the napkins, and out of the corner of my eye I saw chorizo! How crazy is that? Target of all places is selling Spanish chorizo. Well, thank you so much for sharing this, off to the store I go! What a pretty little tidbit! My mind is torn as to thinking if it works better as breakfast or as an amuse-bouche! I love this. Fresh and crunchy. Just open up my appetite anytime anywhere. Hi Fabiola! The world is truly becoming a smaller place 🙂 Enjoy your chorizo! Hi Purabi! Thank you and glad you enjoyed your visit 🙂 I love curry! Hi Sylvia! Thank you and thanks for popping in! I love tapas-like dining! Gosh, that looks wickedly good. Could eat 6 of those right now! Hi Lambchop! Hope you like it! Hi MM! Thank you 🙂 I could probably polish off the same amount as well! The photo with this post looks so delicious! What a cute little stack of food.